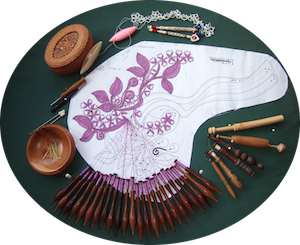 A few years ago a Party of the Rockingham Lace-makers travelled to Bobowa, Poland to learn their type of lace at a workshop run by Ewa Szpila. We stayed with Ewa and her family. Her eldest son made an excellent job of translating and her husband was chief cook and house keeper, there was also a daughter and another son. One of the joy’s of staying with a local family was being accepted by the locals. 2 of us went to the local high school as they wanted to hear English spoken by English people, not as it is taught in school – not too sure what they made of our Yorkshire English. When the children found out we were not too far from Manchester they asked a lot of questions about Manchester United and wanted to know how close we were to the coast. One of the amusing things was when we were having our after-lunch walks through the town /village the school kids would come up to us just to say good morning even though it was the afternoon. Bobowa is in a mining area but the surrounding mountains and rivers are very beautiful. When we were there it was just like going back the 1950’s, farmers still ploughing by horse power, mind you this might be because the fields were all on slopes.